“Not everyone will like the caramel apple jam,” Sarah commented to me after we made it. As much as I liked it, I knew she was right: it was very sweet and lacked the tartness that I often crave in my jellies and jams. So we decided to make another jelly/jam, this time doing something decidedly different: wine jelly. What’s “wine jelly”? It’s much like grape jelly, but instead of using grape juice, you use a bottle of wine of your choosing for the primary liquid in the jelly. In this case, we chose to use a bottle of Celebrate, a 2007 wine from a local winery, White Oak Vineyards. It’s a ruby red semi-sweet wine made from a blend of grapes that has a tartness to it that’s almost like cranberries. We quite like it. 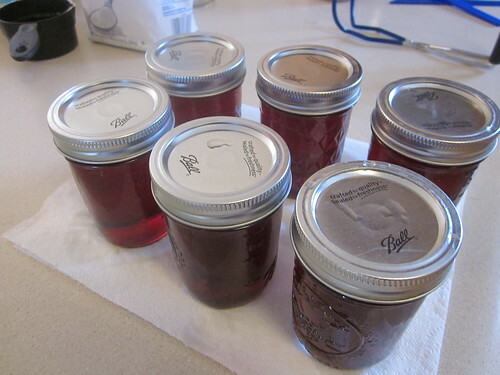 Thus, one fun way to make this jelly is to choose a bottle of wine from a local winery that you particularly like and use it as the backbone for your jelly. This enables the wine to have a bit of additional local flavor to it. You can, of course, use any wine of your choosing – for example, a bottle of Charles Shaw from Trader Joe’s will work quite well and only set you back $3 for the wine. 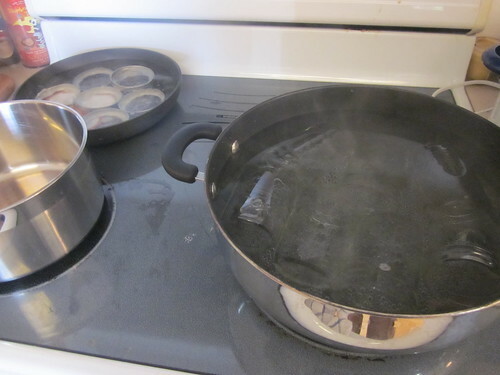 You’ll also, of course, need the usual stuff for canning: six jars with lids and rings, a pot to boil the stuff in, and some sort of mechanism for pulling the jars in and out of boiling water. In the pictures below, we’re using a plastic “bucket” we found for fifty cents at a sale recently. A note on the wine: you’ll often need a bit more liquid than what a bottle of wine contains, as a bottle will often only give you three cups or a bit more. Feel free to add the remnants of a second wine or even a bit of grape juice to get yourself up to the total amount. 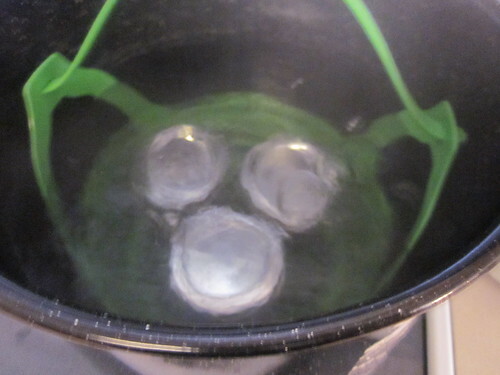 The first step, of course, is to boil the jars, lids, and rings and make sure they’re as clean as possible. This way, you minimize the chance of unwanted bacteria inside of the jars, which would render the jelly unusable. After that, just mix the wine, lemon juice, and pectin in a large sauce pot (one that can easily hold 12 cups of liquid. Bring it to a boil while stirring it rapidly. 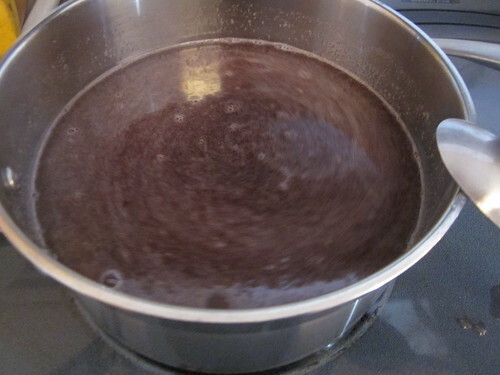 Once it’s boiling, add the sugar, then keep stirring rapidly to dissolve all of the sugar in the liquid. Bring it back to a rolling boil while stirring, then boil it for at least one minute while stirring (you can boil it a bit longer – if you do, the jelly will be just a bit thicker). Once the hot jelly is finished, ladle the jelly into the jars, leaving 1/2″ inch (1.3 cm) at the tops of the jars for breathing room. Put the lids on them, then put the jars into a boiling water bath for five minutes (you can do this in shifts, of course). You’ll find that you have enough jelly for six jars, with a bit left over. We used that “bit left over” on our morning toast for a few days – delicious! When you’re done, put the jars out on a towel and leave them untouched for 24 hours. Leave at least an inch of space between each of the jars. After the 24 hours are up, check the lids and make sure none of them have popped up. If you’re unsure, press down a bit on the middle of a lid – if it “clicks” or “pops,” that’s a bad jar. Most likely, they’ll all be fine, but don’t keep a bad jar of anything that you can. 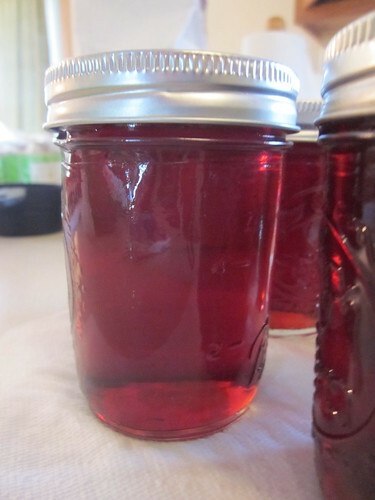 As you can see, our jelly turned out with a reddish-purple color. It’s a bit tart and, in my opinion, is almost perfect on toast in the morning. 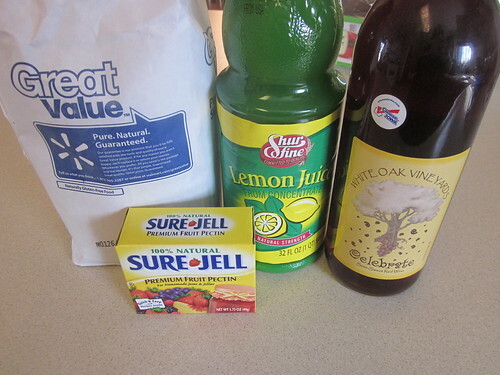 Later, we’re going to make a second batch of this jelly, using one of our favorite white wines. This will result in a yellowish or nearly clear jelly.